Aim: To evaluate the effect of different root canal irrigants on the sealing ability of two self-etch adhesives, using dye penetration method, within the pulp chamber. Materials and Methods: 72 extracted human molars were divided into six groups, according to the irrigant and self-etch adhesives used. After de-roofing the pulp chamber with a carborundum disc, the pulp was extirpated using excavator and broaches. In 36 samples, pulp chambers were bonded with Xeno V after irrigation with either 2% CHX (Group1: Xe-CHX) ; 17% EDTA + 5.25% NaOCl (Group2: Xe- EDTA + NaOCl) or normal saline (Group3: Xe-NS) and in other half samples, pulp chambers were bonded with Adper Easy One after irrigation with either 2% CHX (Group 4: Ad-CHX); 17%EDTA + 5.25% NaOCl (Group5: Ad-EDTA+NaOCl) or normal saline (Group 6: Ad-NS). All the samples were restored with Filtek Z350. Ten teeth from each group were assessed for dye penetration. Two samples in each group were viewed under scanning electron microscope to observe resin-dentin interfacial adaptation. Data was statistically analyzed using Mann-Whitney and Kruskal Wallis tests at a significance level of P < 0.05. Results: Mean microleakage scores and standard deviation observed were: Group 1 (Xe-CHX): 2.8 ± 0.42, Group 2 (Xe-EDTA + NaOCl): 2.3 ± 0.82, Group 3 (Xe-NS): 2.9 ± 0.31, Group 4 (Ad-CHX): 1.2 ± 0.91, Group 5 (Ad-EDTA + NaOCl): 0.8 ± 0.63, Group 6 (Ad-NS): 1.9 ± 0.99. Conclusions: Adper Easy One showed significantly less leakage than Xeno V when normal saline was used as an irrigant. EDTA treatment followed by NaOCl application significantly reduced microleakage and improved the interfacial adaptation with Adper Easy One. CHX did not significantly affect the sealing ability of both one-step self-etch adhesives tested. Restoration of endodontically treated teeth with adhesive restoration permits transmission of functional stresses across the bonded interface to the tooth, with the potential to reinforce weakened tooth structure. , Main challenge for a dental adhesive is its ability to bond equally and effectively to two substrates of different nature i.e., enamel and dentin. Recently, the one-step self-etch system has been introduced which incorporates all the components of an adhesive system (etchant, primer, and bonding resin) into a single bottle, resulting in a reduced step, user-friendly adhesive. , However, these newer adhesives are being introduced at a very fast rate, without comprehensive testing to substantiate their performance. Adhesive materials are frequently compared on parameters like bond strength and microleakage. Typically, dentin shear bond strengths reported for adhesive resins are 20 to 30 MPa, which can vary depending on the testing methods used. Microleakage is more important for endodontic applications than bond strength, as a material with relatively low bond strength to dentin may be a good obturating material preventing microleakage effectively. Till date none of the current adhesive materials has been proved to provide a hermetic seal. Although multitude of studies report microleakage patterns after adhesive procedures in class V cavities in coronal dentin, there is scarcity of data evaluating the bonding of self-etch adhesives to pulp chamber in endodontically treated teeth, which is the deepest possible coronal dentin. Therefore, the purpose of this study is to evaluate and compare microleakage of two one-step self-etch adhesives placed within the pulp chamber following different irrigation regimens. Seventy-two human molars freshly extracted due to periodontal reasons were collected and cleaned and stored in normal saline water and used within 6 months of extraction. Teeth with any caries, cracks, abrasions, attrition, and restorations were excluded from the study. Roof of the pulp chamber was exposed using a carborundum disc (Bego, Germany) horizontally 1.5 mm coronal to the cementoenemel junction and roots were sectioned 2 mm apical to the bifurcation with water coolant. Pulp tissue was removed carefully with the help of excavator and broaches (Spirocolorinox, Dentsply Maillefer, Switzerland). Canal orifices were widened with Gates Glidden (Gates drills, Mani, Inc., Tochigi, Japan) drill no. 2-3. Root ends were sealed with amalgam (DPI Alloy, Dental Products of India, Mumbai, India). Teeth were randomly divided into two groups of 36 teeth each according to the one-step self-etch adhesive used: Xeno V (Dentsply De Trey, Konstanz, Germany) and Adper Easy One (3M ESPE, St Paul, USA). Each group was further sub-divided into three groups of 12 teeth each, according to the irrigation solution used: 2% CHX (Dentachlor, Ammdent, Mohali, India); 17% EDTA (SmearClear, Kerr, SybronEndo, Glendora, USA) and 5.25% NaOCl or saline. Group 1: Xe-CHX (XenoV with 2% CHX) Pulp chambers were continuously irrigated with 1 ml of 2% chlorhexidine for 60 s.
Group 2: Xe-EDTA + NaOCl ( XenoV with 17% EDTA followed by 5.25% NaOCl) Pulp chambers were continuously irrigated with 1 ml of SmearClear for 60 seconds followed with 3 ml of 5.25% NaOCl for 60 s.
Group 3: Xe-NS (XenoV with saline as control) Pulp chambers were continuously irrigated with normal saline solution for 60 s.
Group 4: Ad-CHX (Adper Easy One with 2% CHX) Pulp chambers were continuously irrigated with 1 ml of 2% chlorhexidine for 60 s.
Group 5: Ad-EDTA+NaOCl ( Adper Easy One with 17% EDTA followed by 5.25 % NaOCl ) Pulp chambers were continuously irrigated with 1 ml of SmearClear for 60 s followed with 3 ml of 5.25% NaOCl for 60 s.
Group 6: Ad-NS (Adper Easy One with saline as control) Pulp chambers were continuously irrigated with normal saline solution for 60 s.
Distilled water was used in all the above samples for 60 s as final flush and were blot dried. Pulp chambers in groups 1, 2, and 3 were bonded with Xeno V and groups 4, 5, and 6 were bonded with Adper Easy One adhesive according to manufacturer's directions [Table 1]. All the samples were restored with composite resin Filtek 350 (3M, ESPE, St. Paul, USA) in one to two increments and condensed with condenser and were light cured at 500 mw/ cm 2 by Spectrum 800 (Dentsply, Caulk, Milford, USA) for 20 s. Ten teeth from each group were used for dye penetration and two speciemens were subjected to scanning electron microscopic analysis. Speciemens were coated with two layers of nail polish leaving 1 mm window around restoration margin and were immersed in 2% methylene blue for 2 days. They were washed under running water and air dried at room temperature for 24 h. All teeth were than sectioned for evaluation under stereomicroscope and were scored [Table 2]. The data were statistically analyzed by Kruskal-Wallis and Mann-Whitney U-tests using SPSS Base 15.0 software at significance level of P < 0.05. A total of 12 molars (2 samples per group) were used for SEM analysis. After being restored with composite, the sectioned surface of molars were ground on wet 210 grit SiC paper. Acid base treatment was done and then samples were dehydrated in ascending ethanol concentration (50%, 75%, and 95% for 20 min each and 100% for 1 h), then transferred to a critical point dryer for 30 min. The specimens were then gold sputter coated and the surfaces were examined under a SEM at 1000-5000X magnification. Dye penetration scores and statistical analysis results are depicted in [Table 3]. None of the groups completely prevented dye leakage. Extensive dye leakage was observed in all the samples bonded with Xeno V irrespective of the irrigation regimens used. Highest mean microleakage score was observed with Xeno V after saline irrigation (Group3: 2.90 ± 0.3162) followed by Xeno V with CHX irrigation (Group1:2.80 ± 0.4216) and Xeno V with EDTA + NaOCl irrigation (Group2:2.30 ± 0.8233), respectively. There was no statistically significant difference between group 1 and group 2 (P=0.218); group 1 and group 3 (P = 0.739), and group 2 and group 3 (P = 0.123). Least mean microleakage score was observed with Adper Easy One after EDTA+NaOCl irrigation (Group5:0.80 ± 0.6325) which was significantly less than with Adper Easy One and saline irrigation group 6 (1.90 ± 0.9944) (P = 0.023). CHX-treated Adper Easy One group (Group 4: 1.20+0.9189) depicted no significant difference in dye penetration with either group 5 (P = 0.393) or group 6 (P = 0.165). For every irrigation regimen Adper Easy One performed better than Xeno V. Significantly less dye penetration was observed in: group 4 as compared to group 1 (P < 0.001); group 5 as compared to group 2 (P < 0.001) and group 6 compared to group 3 (P = 0.035). 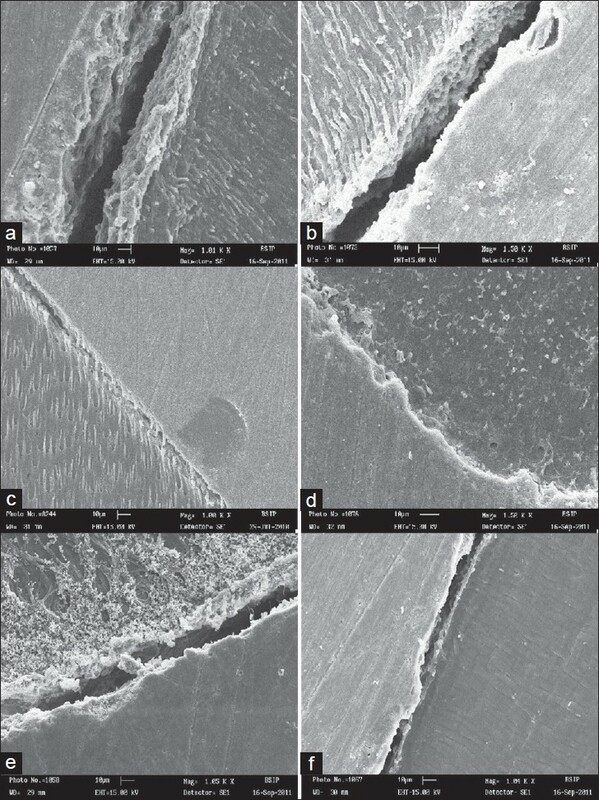 Scanning electron microscopic observation of resin dentin interfaces of all groups demonstrated the presence of gaps along the entire interface showing poor adaptation [Figure 1]a-c, e, f except EDTA and NaOCl-treated group with Adper Easy One (group 5) which revealed excellent interfacial adaptation of resin to the pulpal dentin with a complete absence of gap [Figure 1]d. CHX-pretreated groups with Xeno V and Adper Easy One both revealed the presence of gaps; however, less gap was observed with Adper Easy One. Xeno V showed poor interfacial adaptation regardless of the irrigant used. Adper Easy One revealed significantly (P < 0.05) better performance in comparison to Xeno V. This result may be attributed to different factors like pH, type of solvent, HEMA presence, vapour pressure, and wetting angle. Although comparatively less microleakage and better adaptation at the resin-dentine interface was observed with Adper Easy One after CHX pretreatment, the effect was not significant for both the self-etch adhesives. Our results are similar to study of Santos et al. who preferred to consider that chlorhexidine did not affect the interaction of the self-etching adhesive system to pulp chamber dentin because it is a nonoxidizing agent. Contrary to our study, Turkun et al. and Meiers and Kresin  reported a positive effect of CHX on bonding of self-etch adhesives. Erdemir et al. also reported that endodontic irrigation with a CHX solution significantly increased bond strength to root dentin which can be due to adsorption of CHX by dentin favoring the resin infiltration into dentinal tubules. However, dissimilar to our study they evaluated the effect of 0.2% of CHX on bonding of C and B Metabond to root canal dentin. Microleakage was observed with both Adper Easy One and Xeno V control groups in this study which could be attributed to different characteristics of pulp chamber dentin. Bonding to pulp chamber dentin is difficult to achieve. The structure of the pulp chamber wall is complicated which includes collagen-rich predentin, sclerotic dentin, regular and irregular secondary dentin high density of tubules (65000 mm 2 ) with large tubule diameters, small amount of intertubular dentin, and many accessory canals. , In addition, because there have been no cavity preparation, a smear layer typically has not been formed. Consequently, bonding of the adhesive material to pulp chamber walls is different from bonding to other dentinal surfaces covered with smear layers. In addition, box shape pulp chamber may also influence the sealing ability of the materials because of polymerization shrinkage caused by the high C- factor (the ratio of bonded to unbonded surface area). The smaller the C-factor, the less the competition between the strength of the bond and the forces of polymerization contraction. Further studies should aim to delineate guidelines for the time, concentration and sequence of endodontic irrigants with self-etch adhesives. This study evaluated the bonding potential to pulp chamber dentin; however, more research is required to investigate bonding of resin cements to root canal dentin. Furthermore, durability of these simplified adhesives in clinical conditions should be tested. Irrigation with EDTA and NaOCl or CHX did not negatively affect sealing ability of both the one-step self-etch adhesives tested. 1. Ray HA, Trope M. Periapical status of endodontically treated teeth in relation to the technical quality of root filling and the coronal restoration. Int Endod J 1995;28:12-8. 2. Swanson K, Madison S. An evaluation of coronal microleakage in endodontically treated teeth. Part I. Time periods. J Endod 1987;13:56- 9. 3. Magura ME, Kafrawy AH, Brown CE Jr, Newton C. Human saliva coronal microleakage in obturated root canals: An in vitro study. J Endod 1991;17:324-31. 4. Maruok R, Nikaido T, Ikeda M, Ishizuka T, Richard M. Foxton, et al. Coronal Leakage Inhibition in Endodontically Treated Teeth Using Resin-coating Technique. Dent Mater J 2006;1:97-103. 5. Galavan RR Jr, West LA, Leiwhr FR, Pashley DH. Coronal microleakage of five materials used to create an intracoronal seal in endodontically treated teeth. J Endod 2002;28:59-61. 6. Vertucci FJ, Anthony RL. A scanning electron microscopic investigation of accessory foramina in the furcation and pulp chamber floor of molar teeth. Oral Surg Oral Med Oral Pathol 1986;62:319-26. 7. Seltzer S. Endodontology. Philadelphia: Lea & Febiger; 1988. p. 314-5. 8. Eakle WS. Fracture resistance of teeth restored with class II bonded composite resin. J Dent Res 1986;65:149-53. 9. Douglas WH. Clinical status of dentin bonding agents. J Dent 1989;17:209-15. 10. Leinfelder KE, Kurdziolek SM.self-etching bonding agents. Compend Contin Educ Dent 2003;24:447-54. 11. Dunn JR. iBond: The seventh generation, one bottle dental bonding agent. Compend Contin Educ Dent 2003;24:14-8. 12. Yamada RS, Armas A, Goldman M, Lin PS. A scanning electron microscopic comparison of a high volume final flush with several irrigating solutions: Part 3. J Endod 1983;9:137-42. 13. Baumgartner JC, Mader CL. A scanning electron microscopic evaluation of four root canal irrigation regimens. J Endod 1987;13:147-57. 14. Zehnder M. Root canal irrigants. J Endod 2006;32:389-98. 15. Cezar C, Gomes B, Zaia A, Teixeira F, Souza-Filho FJ. In vitro assessment of the antimicrobial action and the mechanical ability of chlorhexidine gel as an endodontic irrigant. J Endod 2001;27:452-5. 16. Sim TP, Knowles JC, Ng YL, Shelton J, Gulabivala K. Effect of sodium hypochlorite onmechanical propert es of dentin and tooth surface strain. Int Endod J 2001;34:120-32. 17. Santos JN, Carrilho MR, De Goes MF, Zaia AA, Gomes BP, Souza-Filho FJ, et al. Effect of chemical irrigants on the bond strength of a self-etching adhesive to pulp chamber dentin. J Endod 2006;32:1088- 90. 18. Richard S. Schwartz Adhesive dentistry and endodontics Part 2: Bonding in the root canal system the promise and the problems: A review. J Endod 2006;32:1125-34. 19. Van Meerbeek B, Van Landuyt K, De Munck J, Inoue S, Yoshida Y, Perdigao J, et al. Bunoncore memorial lecture.Adhesion to enamel and dentin: Current status and future challenges. Oper Dent 2003;28:215-35. 20. Aguilar-Mendoza JA, Rosales JI, Rodriguez MA, Lopez SG, Cabrerizo. Wettability and bonding of self-etching dental adhesives. Influence of the smear layer. Dent Mater 2008;24:994-1000. 21. Gregoire G, Dabsie F, Sarr, Akon B, Sharrock P. Solvent composition of one-step self-etch adhesives and dentin wettability. J Dent 2011;39:30-9. 22. Garcia FC, Otsuki M, Pashley DH, Tay FR, Carvalho RM. Effects of solvents on the early stage stiffening rate of demineralized dentin matrix. J Dent 2005;33:371-7. 23. Van Landuyt KL, Snauwaert J, Peumans M, De Munck J, Lambrechts P, Van Meerbeek B. The role of HEMA in one-step self-etch adhesives. Dent Mater 2008;24:1412-9. 24. Nikhil V, Singh V, Chaudhary S. Comparative evaluation of bond strength of three contemporary self-etch adhesives. An ex vivo study. Contemp Clin Dent 2011;2:94-7. 25. Dogan H, Calt S. Effects of chelating agents and sodium hypochlorite on mineral content of root dentin. J Endod 2001;27:578-80. 26. Perdigao J, Thompson JY, Toledano M, Osorio R. An ultra-morphological characterization of collagen depleted etched dentin. Am J Dent 1999;12:250-5. 27. Wakabayashi H. A new method of pretreating dentin adherent surface with organic substance dissolving agent and with bonding agent. J Jpn Soc Mat Dev 1993;12:279-94. 28. Pioch T, Kobaslija S, Huseinbegovic A. The effect of NaOCl dentin treatment on nanoleakage formation. J Biomed Mater Res 2001;56:578- 83. 29. Wakabyashi Y, Kondou Y, Suzuki K. Effect of dissolution of collagen on adhesion to dentin. Int J Prosthodont 1994;4:302-6. 30. Ganesh C, Gopikrishna V, Prakash R, Kandaswamy D, Parameswaran A. Evaluation of nanoleakage follwoing deporotienization of dentin using varying concentrations and application times of sodium hypochlorite solution and gel - An in vitro confocal laser scanning microscope study. J Conserv Dent 2005;8:27-36. 31. De Castro AK, Hara AT, Pimenta LA. Influence of collagen removal on shear bond strength of one bottle adhesive system in dentin. J Adhes Dent 2000;2:271-7. 32. Prati C, Chersoni S, Pashley DH. Effect of removal of surface collagen fibrils on resin dentin bonding. Dent Mater 1999;15:323-31. 33. Calt, Serper A. Time dependent effects of EDTA on dentin structures. J Endod 2002;28:17-9. 34. Kai Zhang, Young Kim, Cadenaro M. Effects of different exposure times and concentrations of sodium hypochlorite/ ethylenediaminetetracetic acid on the structural integrity of mineralized dentin. J Endod 2010;36:105-9. 35. Turkun M, Turkun LS, Kalinder A. Effect of cavity disinfectants on the sealing ability of non rinsing dentin bonding resins. Quintessence Int 2004;35:469-76. 36. Meiers JC, Kresin JC. Cavity disinfectants and dentin bonding. Oper Dent 1996;21:153-9. 37. Erdemir A, Ari H, Gungunes H, Belli S. Effect of medications for root canal treatment on bonding to root canal dentin. J Endod 2004;30:113- 6. 38. Berkovitz BK, Holland GR, Moxham BJ. A color atlas and textbook of oral anatomy, histology and embryology. 2nd ed. London: Wolfe Publishing; 1992:130-45. 39. Schellenberg U, Krey G, Bosshardt D, Nair PNR. Numerical density of dentinal tubules at the pulpal wall of human permanent premolars and third molars. J Endod 1992;18:104-9.